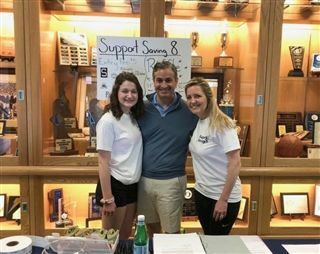 Last night, NBC 10 News featured a story on Gabby Penna '20, highlighting her work with the Support Saving 8 Basketball Tournament and the upcoming Donor Dash. Gabby has been working tirelessly to raise awareness about the benefits of being an organ donor, even starting an Auks Support Life Club on campus. At the end of last year, Gabby and Reid Hartman '19 started the club with the main goal of providing support to the Gift of Life Organization. As of this past summer, they have clubs established at seven other Delaware High Schools, created to raise awareness about the importance of organ donor registration. Each April, Gift of Life hosts a Donor Dash in celebration of the life-saving power of organ and tissue donation and to honor the donors who make it possible. For this year's Donor Dash, Gabby and Reid orchestrated one big team of student participants from Archmere, Charter School of Wilmington, Padua, Salesianum, Sanford, Tatnall, Ursuline, and Wilmington Friends on "Team Penna". In order to secure bus transportation for all the involved schools, they hosted a successful fundraiser, the "Support Saving 8 Basketball Tournament", held at Salesianum on March 30th. The Gift of Life Donor Dash is on April 14th. Come join our Auks in the 3k walk which is a unique opportunity for donor families, recipient families, those waiting for an organ, and community supporters to walk together in unity. Registration details for Team Penna are available on the Gift of Life website. To view the news segment that aired on NBC 10, click here.